Lovely cottage in private setting that overlooks Chimney Garden. 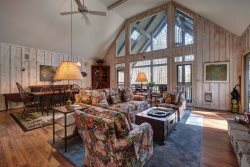 Beautifully furnished with vaulted ceilings in the great room and an open floor plan. Separate dining room opens to screened porch. Master bedroom suite is on main level with two guest suites upstairs. Come relax in this gated private community that is only 2½ miles from the Cashiers Crossroads. No smoking permitted in home.